After a review of the literature on the role of ideas, interests, and institutions in public policy analysis, the chapter illustrates the explanatory framework. The latter builds on historical and discursive institutionalism, pointing to the role of ideas, discourse, and institutions. The chapter presents the core ideas and arguments in favor of decentralization, which are mainly associated with New Public Management (NPM) and theories of fiscal federalism, as well as those supporting (re)centralization. These ideas and arguments constitute the substantive content of discourse over the territorial organization of health systems. The institutional factors the book considers are the formal institutional setting and the system of intergovernmental relations. Finally, the chapter illustrates the working hypotheses, the research design and the methods, as well as the sources of empirical material. DICE Database. 2001. 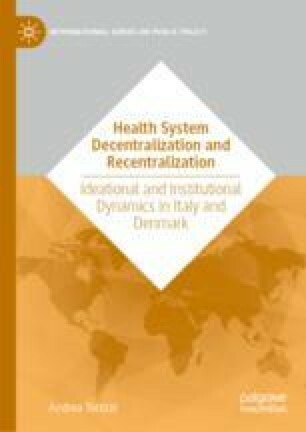 “Health Systems: General Description and Level of Centralization of Health Systems.” ifo Institute, Munich. Available at http://www.cesifo-group.de/DICE/fb/xqz93Nq9.